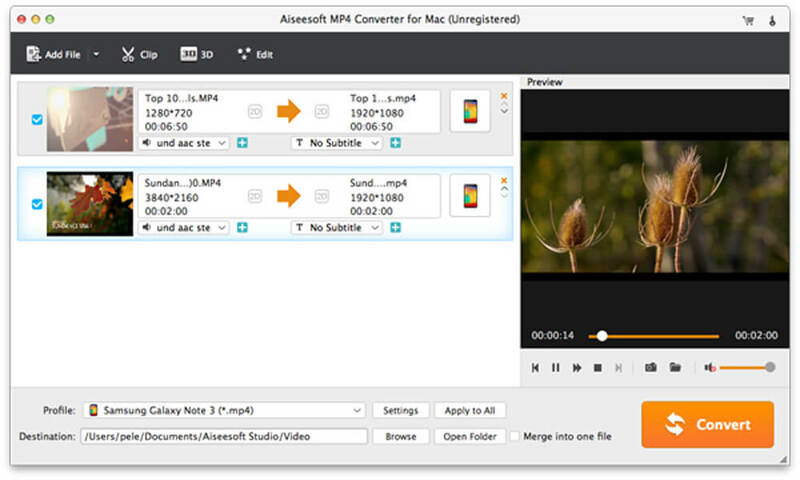 Aiseesoft MP4 Converter for Mac can help you convert any SD and HD video format to MP4 for playback on iPhone, iPad, iPod, Samsung Galaxy S4, Samsung Galaxy Note 2, HTC One, PSP, PS3 and portable MP4 Players. It can convert video formats like MOV, WMV, AVI, MTS, M2TS, MXF to MP4 and convert MP4 to any other video format. Moreover, this Mac MP4 video conversion software supports converting video to 3D formats on Mac. It is capable of converting a variety of video formats including MPG, MPEG, MPEG 2, VOB, DAT, MP4, M4V, TS, RM, RMVB, WMV, ASF, MKV and so on to MP4. This MP4 conversion software allows users to convert any video to 3D formats on Mac easily. There are 14 types of 3D modes available including Anaglyph 3D (10 types), Side By Side (Half-Width/Full) 3D, Top and Bottom (Half-Height/Full) 3D. This software works well with iPhone 6/6 Plus/5S/5C, iPad Air 2, iPad mini 3, iPod, Samsung, HTC, Kindle fire, Sansa, Sony Walkman, Creative Zen, Apple TV, Nokia, PSP, Zune, and so on. Trimming video or audio files can be easily achieved by this software. You can trim or crop any length of video you like or remove the black edges. You can merge any file or some selected into one output file. Watermark of text or image can be inserted. You are free to choose the subtitle and audio track before you convert video. You are allowed to preview the source file and converted file during your conversion. It can finish the process at remarkable conversion speed.